The head of the Federal Emergency Management Agency was investigated for his use of government vehicles. WASHINGTON — The head of the federal disaster response agency used government vehicles without proper authorization, but will not lose his job over it, Homeland Security Secretary Kirstjen Nielsen said Friday. Federal Emergency Management Agency Administrator Brock Long had been under investigation by the Department of Homeland Security's Office of Inspector General over possibly misusing government vehicles to travel to his home in Hickory, North Carolina. Word of the investigation leaked earlier this month just as Hurricane Florence was poised to make landfall. Nielsen said in a statement Friday that there had been a longstanding practice to transport FEMA administrators in government vehicles to ensure they could remain connected during a crisis. But despite this practice, use of government vehicles for home-to-work travel was not officially authorized, and that practice was eliminated in April. Nielsen said the report by Homeland Security's Office of Inspector General also found Long used government vehicles for non-official reasons. She said they spoke about the problems and Long agreed to reimburse the government, though it wasn't clear how much money that might be. 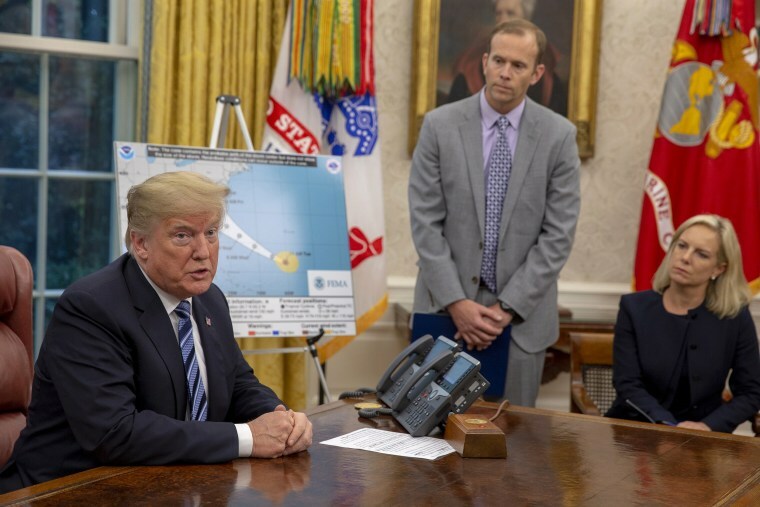 She said she directed the department to review policy on home-to-work transportation problems, assess communication requirements at FEMA so officials can be best connected during disasters, and to review training regarding proper use of government vehicles. "We had a productive conversation where we discussed my expectations regarding the agency's use of government vehicles going forward," Nielsen said in a statement. "The administrator acknowledged that mistakes were made, and he took personal responsibility." The inspector general's report has not been made public. The House Oversight Committee is also looking into the allegations and has asked Long to turn over to the committee all documents related to the trips by Oct. 1, including whether his staff was put up in hotels paid for by taxpayer dollars. The inspector general's office has turned the review over to federal prosecutors to determine whether any criminal charges are warranted, according to a person familiar with the probe. It's not uncommon for an inspector general to refer cases so federal prosecutors can determine whether charges are warranted, and it doesn't mean he'll be charged with a crime. The person was not authorized to speak publicly on the matter and requested anonymity. In the days after Florence struck, Long said he was not focused on the investigation and instead was working to help the region get back on its feet after the devastation. More than 40 have died and rising floodwaters cut off roads and drowned livestock. In a statement Friday, Long said he accepted full responsibility. "The secretary and I are taking corrective action to prevent such mistakes from happening in the future," he said. "I remain committed to the critical mission of FEMA—helping people before, during and after disasters." He has been head of the Federal Emergency Management Agency since June 2017, presiding over a particularly grueling hurricane season that included Irma, Harvey and Maria, plus wildfires in California. The response to Maria has been heavily criticized, and Long has said FEMA learned lessons on how to better prepare for this year's storms. Other Trump administration officials have lost their jobs over ethics issues related to travel, but they involved more outsized allegations. The former head of the Environmental Protection Agency, Scott Pruitt, resigned in July after allegations of massive security spending, first-class flights and a sweetheart condo lease.